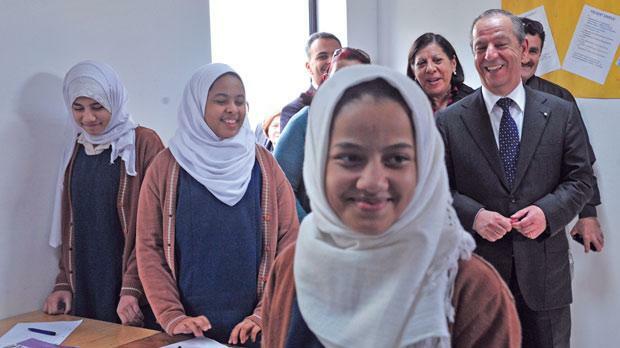 The Muslim school in Paola stands to receive €700,000 in retroactive subsidies if Prime Minister Lawrence Gonzi is re-elected, apart from further annual grants of €300,000. This emerged yesterday after Dr Gonzi and Education Minister Dolores Cristina were given a tour of the Mariam Al Batool School by Imam Mohammed Elsadi and headmistress Maria Camilleri, a former Labour MP. “Your school is our school and your children are our children,” Dr Gonzi told parents and teachers at the end of the visit where he lauded the school’s efforts in promoting diversity. Imam Elsadi thanked Dr Gonzi for granting the school interest-free loans in 2011 and 2012 amounting to €200,000 each, without requesting any guarantees. “Without this help, the school would have had to close down,” said the Imam, who spoke of the financial difficulties the school faced, especially during the height of the Libyan revolution. Showering Dr Gonzi with praise for supporting the revolution and the non-profit school, which has 284 students, Mr Elsadi half-jokingly added that he would love the €400,000 in loans to be written off and for parents to be given more support. Dr Gonzi at first poked fun at the “elegant” way Mr Elsadi made the request but quickly vowed to offer his assistance. He assured the school that, if he were re-elected, the loans would be written off and the Government would honour its Budget proposal allocating an additional €300,000 grant for this year, a grant expected to be sustained annually. Mr Elsadi made other requests that were not dismissed by the Prime Minister. He asked for the Government to issue a directive to the public and private sector not to discriminate against Muslim women who chose to wear the hijab headdress at work or in school. Mr Elsadi also asked for multi-faith prayer spaces in buildings such as the airport, the hospital and post-secondary schools. Pointing to previous controversies surrounding makeshift mosques, he said the mosque in Paola could not serve the entire community in Malta. He therefore asked for permits to be issued to regularise the position of existing places of worship. He also asked for the Government’s help in making sure permits were issued by the planning authority for the school’s extension. The recognition of Islamic feasts and Islamic animal slaughter were also mentioned as areas of importance for Muslims in Malta. “May Allah reward you and grant you more success,” concluded Mr Elsadi. Dr Gonzi promised to grant “all thehelp necessary” for the school to succeed and said it should not be difficult to provide more praying facilities around the country. “I am proud of the fact that the Maltese have always been a society open to different cultures without discriminating against anyone,” he added. He also promised to cooperate with the Libyan Government’s plans to upgrade the Libyan school in Ta’ Giorni into a higher education institution. Before his visit to Paola, Dr Gonzi spoke to supporters at Villa Arrigo where he pledged to open the Marsascala family park before the election, saying it would be the largest park on the island, the size of 21 football grounds. He spoke of his pride at being given a top “certificate” of excellence by German Chancellor Angela Merkel during his visit to Berlin on Wednesday.